The Leo symbol is accompanied by a tiger eye gemstone in these earrings made with both silver-plated and silver-filled components; approximate length is 5 cms (~1.96 inches). 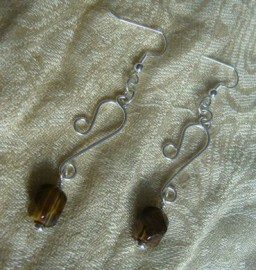 Tiger eye is one of Leo gemstones; the honey/golden-brown bands in the tiger eye stone resemble the shine in lion's eyes. Leo is the fifth astrological sign in the Zodiac and tiger eye is one of Leo gemstones. If your Sun sign or your Rising sign is Leo, you may feel attracted by tiger eye and you will certainly benefit from its energy (this can also happen if you have various planetary points in Leo or a dominant planet in that sign). Tiger eye is said to stimulate the courage so characteristic of Leo while keeping a grounded perspective, which may be needed when Leo's flamboyance goes overboard. Various ancient civilizations regarded the tiger eye stone as a symbol of Leo themes: Egyptians believed this gem transmitted the power of the Sun god and Romans used it to emphasize courage in battle.